Combine the Spice paste ingredients and marinate the chicken for at least 6 hours or overnight. Prepare the charcoal fire for direct heat cooking. Thread the marinated chicken pieces onto each skewer. 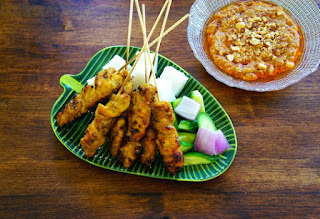 Grill the satay and baste with more oil until they are cooked. Serve warm with some satay sauce, onions, cucumbers and compressed rice.